Home Infographics	Back To School: What’s School like around the World? Back To School: What’s School like around the World? School days are some of the most important of our lives, they help to shape our future and our personalities. With back to school just around the corner, we decided to take a look into the differences in school life around the world. How do certain factors differ and how does this impact upon students, their success, and well-being? How does the UK’s education system compare to other countries ways of schooling? We’ve taken a look at what the average schooling is like in different global destinations. Please include attribution to https://www.shoezone.com with this graphic. Uniform: Each school sets their own policy, but uniform is usually compulsory. 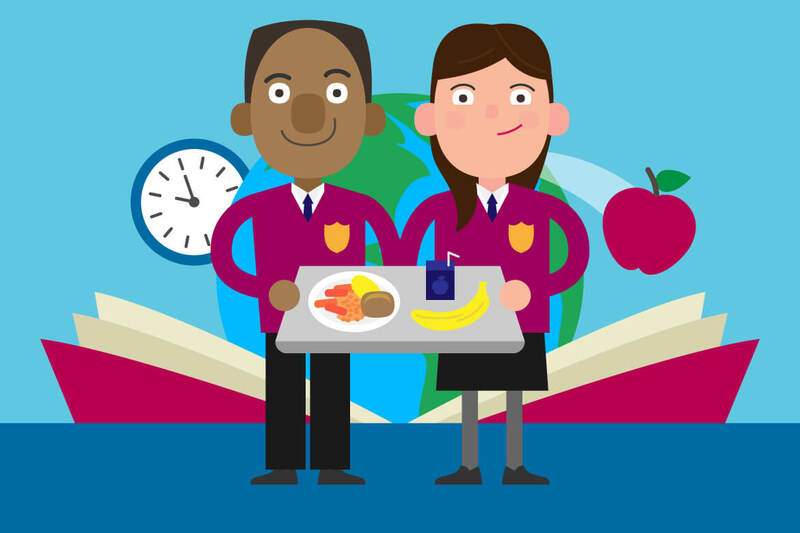 Lunch/Food: Sadly some of the least healthy options across the globe, UK school lunches often use processed foods. Lunch can be bought from the canteen or taken into school from home. Breaks: 20 minutes morning break, followed by 45 – 60 minutes lunch break. Infant schools also have an afternoon break. Uniform: Most English schools require students to wear a uniform, but rules are more relaxed in Scotland & Wales. Brazilian schools are often constrained by budgets and can struggle to afford to teach the basics. This means courses such as music and art are often missed out, especially in poorer areas. Despite this, Brazilian school children are some of the most satisfied with their lives. Lunch/Food: Usually eaten at home, after school. Lunches available at school have a good balance of meat & plant proteins & vegetables. Chinese education, particularly Maths, is taught by drill. This relies on repetition and replication. Such methods seem to work well in terms of academic success particularly in Maths and science, and motivation is high. However, creativity and innovation are often overlooked so the system is currently in reform. Long school days and a high number of days in school per year may take their toll on Chinese students, as their satisfaction in life is rated as below average. Lunch/Food: Provided in school in city schools, but elsewhere children go home for lunch & family time. Uniform: Almost all schools require a uniform to be worn, and many have a formal set for Mondays & special occasions. France has a fairly long school day, but students are in school for the least number of days per year. Unlike in many countries, uniforms aren’t required in France which could potentially create a more relaxed environment. Lunch/Food: School meals in France are an art form, as you might expect from a country renowned for their food! School lunches are intended to teach students about good nutrition. Japanese schooling is notable for extensive rules around uniform. Everything is scrutinised from accessories, make up, and hair styles to school shoes. Japanese students are high achievers who spend the most days at school throughout the year. Satisfaction and motivation, however, are well below average. Lunch/Food: Lunches at school often comprise of rice, fish and miso soup. Students have a long enough lunch break to go home for lunch with family if they choose. Breaks: Long lunch break to allow for time to go home if desired. Uniform: Required, with extensive rules based on formal military dress. Economic and environmental hardships in Kenya make schooling more challenging than some other parts of the world. As a result, comparable data on performance, motivation, and satisfaction was not available. Lunch/Food: Many schools provide lunch, which students sometimes save to share with their families. Uniform: Appropriate uniform must be worn for school in Kenya, and those who do not adhere to these rules risk dismissal. For some families uniforms are unaffordable, and some children can only get access to uniforms and school supplies via a sponsorship programme. Students in Russia stay together in the same class from their first year of school until their last year of mandatory education. The stand out finding in Russia is that classes are typically very small, which allows for Russian children are the most satisfied in life of the cross section we investigated. Lunch/Food: breakfast is provided until 12pm, lunches after 12pm are paid for. Uniform: Not required until a recent law in 2013. Each school can choose its uniform. South Korea’s school day is quite long, and many students stay on or return later in the evening for further study sessions or activities. Students also spend much of their year in school, with limited holiday time. Performance and motivation are high, but life satisfaction is below average for these students. Lunch/Food: Some of the most nutritious school lunches, including fermented foods, carbohydrates, vegetables and fish. Uniform: Government provided uniforms are required.